Please refer to our stock # VW1682 when inquiring. Deployment clasp for the 20mm 18k gold riveted link 20mm fit Rolex bracelets. 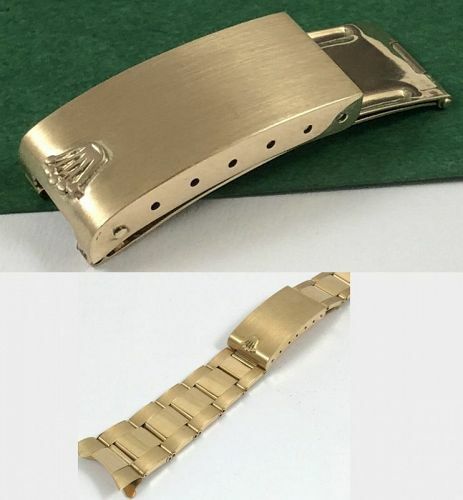 ROLEX 18k GOLD Riveted Link DEPLOYMENT CLASP only. This deployment clasp is marked: PATENTED REGISTERED/ SWISS MADE", and "ROLEXSA/.750". This deployment clasp fits the ref. 80, 76 GMT, Submariner, and President 1803 18k GOLD riveted link bracelet. 16mm diameter, Authentic, original. THIS IS A FINE COLLECTIBLE. DON'T INVEST IN THE STOCK MARKET. BUY SOMETHING PROVEN IN TIME. NOTE: We have been selling vintage watches on E-Bay since 1998 as watchco1974 with over 8500 vintage watch sales and 100% positive feedbacks. You can buy from us with confidence. OTHER NICE FEATURES: Free U.S. Shipping. $38.50 US Priority Mail overseas.